It’s not just the big, high-end brands that are on a roll releasing all manner of new watches. Some of your favorite affordable brands are also getting in on that game. In the Orient Kamasu release, the brand teased that it was just the first of their new divers. We didn’t have to wait long until we found out what the next one is – the Orient Kano was just released yesterday. What is interesting, for me, is the first impression I get seeing a new watch. Sometimes it’s pretty negative (see our commentary on one of the Tudor releases right here), and other times it’s a positive. In this case, it was another Tudor reference that came to mind, the Black Bay. That’s because the first image I saw was of the reference above, with a matte red bezel set against the black dial. That’s where the similarity ends, but that’s the first impression that hit me. Then again, for me, the star of the Orient Kano lineup is going to be that blue bezel set atop the 44mm steel case, especially paired to the steel bracelet. It is worth noting that, while the bracelet itself is solid link, the end links are not solid. Probably not a deal breaker at this price point, but something worth noting if you find yourself being a bit rough and tough on your bracelets. 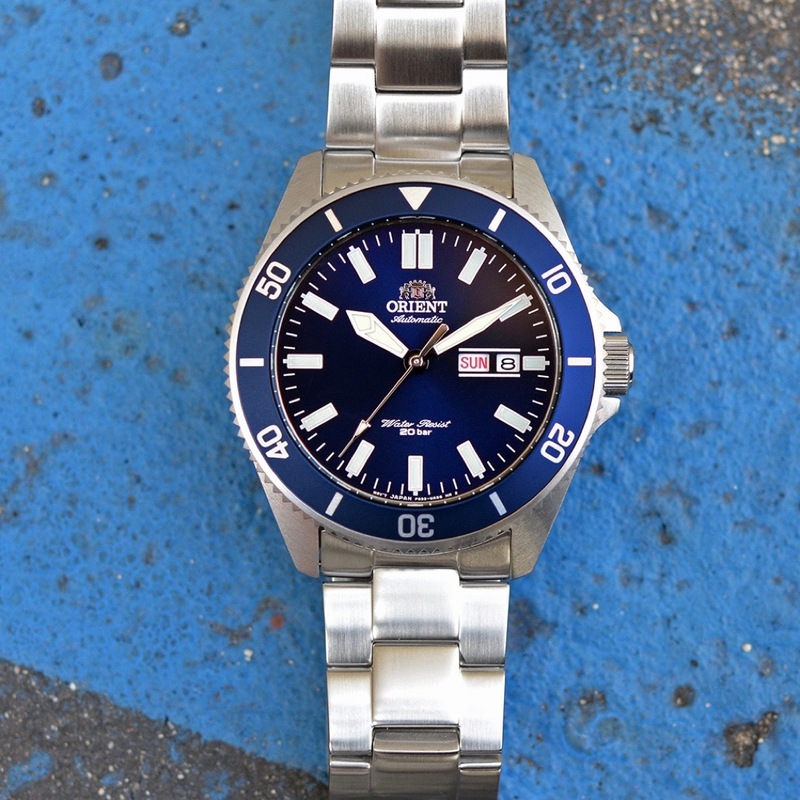 As far as summertime-ready dive watches go, the Orient Kano looks to fit the bill. You’ve got an almost-oversized steel case and mineral crystal protecting that Epson movement (the same F6922 that’s in the Kamasu), with a reasonably-svelte 12.9mm height. This means, particularly on the bracelet, the watch will be ready for some summertime gatherings that are leaning more towards the formal. It also looks like it will be a solid platform to start playing around with some more robust textile strap options as well. Would I wear it? I’d want to see how the bracelet is, but from what I’m seeing here, sure, I would. What I’d change: Why not play around with some wilder color combos, if not on the dial, on the bezel insert? Writer on, and amateur collector of, watches of all types. Along with my writings here, you can find additional watch-related thoughts from me over on aBlogtoWatch. If you're on Twitter and/or Instagram, you'll find me there as @PatrickWatches. This month, we’ve got your chance to win the Armitron Explorer that we recently reviewed. You can get the first part of your entry done in our giveaway post (right here) and then come back here and wrap up your entry. Good luck! WristWatchReview is the oldest watch blog on the Internet. Founded in 2004 by John Biggs, it focuses on accessible horology for the average collector. You can contact us at [email protected] with questions, PR information, or just to chat. The HourTime Podcast: Is it worth $7,000? WristWatchReview is the web's oldest watch blog. It is run by John Biggs, Victor Marks, and Patrick Kansa.